With buying and selling a home still typically taking months to complete, private sector businesses are leading the innovation charge to drive transformation and reform. Conveyancers that resist digital transformation face a challenge to keep up. The digitisation of conveyancing, also known as e-conveyancing, is regularly mooted in the media as something for the future, with the government attempting to take a leading role in reforming how people buy and sell houses, which remains a process filled with bottlenecks and flaws. When the Land Registry set out its priorities for an ambitious digital transformation last year, its chief executive Graham Farrant asked for the support of law firms as it “explores how through digital technology we can… make conveyancing quicker, cheaper and simpler for everyone”. It also recently revealed plans to publish comparative data on how fast and efficiently conveyancers perform, giving home movers more clarity. However, these efforts have raised concerns that taxpayers’ money is being spent unnecessarily on e-conveyancing. Meanwhile, the Law Society, a professional association funded by membership fees from law firms in England and Wales, spent millions of pounds on their Veyo initiative, a failed attempt at introducing e-conveyancing to the masses. The reality is a lot of forward-thinking firms are already doing all manner of conveyancing digitally, from listing the property for sale through to AP1 lodgement. And this innovation is being firmly driven from the private sector. A rapidly growing number of law firms are pursuing a paperless office as they face up to demands from customers to be more efficient and deliver documents back at their convenience. Young property buyers are accustomed to the seamless user experience they enjoy on social media and when banking online, and expect the same from their lawyer. However, many firms lack the knowledge or conviction to make the change. In a study of the mortgage sector conducted for the CML (now UK Finance) by Accenture, 84 per cent of companies said technology could improve customer experiences and relationships, and 76 per cent said it could improve their own operational capabilities. It’s clear that law firms need to transform their businesses and digitise internal processes to survive in an ever-changing market. Time is a lawyer’s only commodity and inefficiencies from poor IT can waste hundreds of pounds a day. 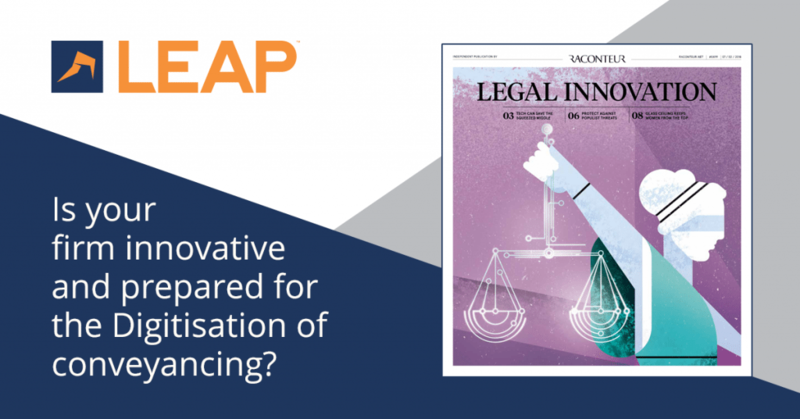 LEAP, the largest provider of innovative software to small law firms in the UK, is leading the innovation charge. Last year, 852 law firms used its document sharing system LawConnect, sharing 63,411 documents. More than this, law firms turn to companies such as LEAP to help with the change management required to go digital. 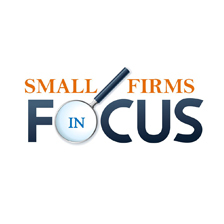 “Our focus is to help small law firms change and be more profitable. Some of those firms just don’t know how to do it, so we have a dedicated team to help,” says Mr Hugo-Hamman. “Our teams travel around the country delivering not only great software, but detailed knowledge of how a legal practice works within the e-conveyancing space. One of those law firms is Ipswich-based Michael Smith & Co Solicitors, which sought a case management system to keep up with the expectations of younger customers, as well as increase efficiencies and ease the burden of dealing with compliance. Like most law firms, Michael Smith & Co is trying to use less paper and using LEAP’s software has allowed it to accelerate those plans. “I feel more assured that our online matters in the case management are likely to be complete, meaning I don’t have to rely on paper files so much in the future because everything is there,” says Ms Hosking. “I also like the fact you can track through the matter, order your searches and get the results back into the matter, so lots of efficiencies are gained. Agility is set to be the new kingmaker in the legal sector and that can only be enabled by digital innovation. In the short-term future, most house purchases will complete within six weeks and law firms that fail to transform in this landscape will struggle to survive. For more information please visit www.leap.co.uk.